We had our third "Crafty Club" gathering last night and it was a success! My friend Sarah hosted it this time and she did a great job entertaining, as always. The evening was filled with conversation, vodka lemonades and crafting. 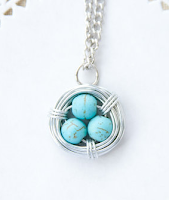 She picked out a great craft -- little bird-eggs-in-a-nest necklaces that we created from wire and beads. picked out the ones we loved. 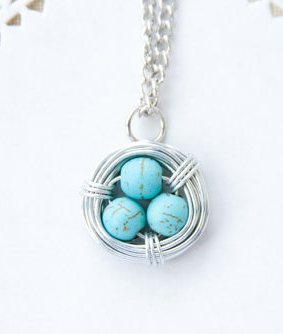 wire to create the nest around the beads. Here's a photo of all of our finished necklaces. Everyones turned out uniquely different. Sarah found the idea for this project on Etsy, so I need to give credit to the woman who makes these and sells them on her Etsy page Poppy & Pine . Here's one of the necklaces she sells. I think ours turned out pretty good considering this was our first time making them! I can't wait to wear mine. I love it! All the necklaces came out so great, I'm glad you enjoyed the tutorial!